Planning a trip to a foreign country can be a lot of fun! Since this is probably your first trip to Morocco, you will want to make sure you clearly think through each aspect of the trip. We have developed a list of questions that you should ask yourself to help you create the ideal Morocco experience. 1. When should I travel to Morocco? There are different opinions of when is the best time to visit Morocco, but you will want to remember a few things. July and August can be extremely hot! If you want to go to the desert, you might want to avoid these times. 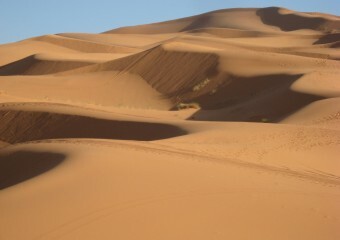 December 22 – January 5 is considered the peak season in Morocco. Many riads have 5 – 7 night minimum stays during that period. March & April is when spring happens in Morocco. The flowers are beautiful and the weather is warming up. September and October are also perfect weather months in Morocco. If you are looking for the “off-season”, consider times like November or February. They are a little cool, but you can find plenty of places in the riads. 2. What type of tour do I want? 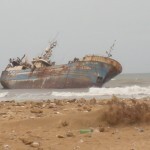 Self Explore – Are you comfortable navigating a foreign country on your own. If you love adventure and don’t mind public transportation, you will love traveling around Morocco on your own. Set Group Tour – Some people want the comfort of an organized tour but are looking to save a little bit of money. If you don’t mind being paired with random travelers and having a fairly tight schedule, then finding a group tour is for you. Private Custom Designed Tour – If you would like the help of experts living in the country to design a tour that meets your budget, interests, schedule and desire, then private tours are the way to go. If you want help organizing a private tour, that is what we specialize in. Contact us! 3. What type of accommodations do I want? Authentic Riads – If you’d like to experience something unique and special, consider staying in a riad. These boutique style hotels usually have 6 – 12 rooms and give very home-like service. The food is handmade and very authentic. Standard Hotel – If you want to save money or like a little more space, you should consider the hotels. Hotels in Morocco have 100 – 300 rooms and are equipped with all of the amenities. The food is usually buffet style with plenty to go around. Hostels or Inns – If you are on a budget, you should consider staying at one of the hotels or little inns. The rooms are often clean and tidy but bathrooms and showers are shared. Breakfast is basic but you get what you are paying for. 4. What do I want to see? Morocco is a very diverse country with ancient walled cities, the sahara desert, Roman ruins, beach towns, and mountains. There is so much to see! 5. How much time to I have to visit Morocco? I usually joke by saying, “I have lived in Morocco for 10 years and I am still discovering amazing places, people and cultural information. Our basic recommendation is that you should give Morocco 10 – 14 days if you want to explore the main cities including the Sahara desert. If you only have 7 – 8 days, we recommend sticking to the main historical cities like the Imperial Cities tour. If you have 14 days, you could consider visiting the Blue City of Morocco, the desert, Fes, Marrakech and Essaouira. If you want help laying out an ideal itinerary for the time you have, please contact us. A riad is typically a traditional old house located mainly within the old walled in cities of Morocco. As riads are often located within the walls of the old cities you often must walk a little bit to reach the front door of the guest house. But, it is well worth the effort. 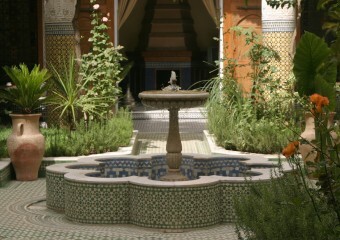 The word riad comes from Arabic meaning garden. Riads were often built inwardly with the windows and the doors of the rooms opening into a central courtyard that is often open to the sky. This layout offered protection for the wives and children from the eyes of prying neighbors and outsiders. The central courtyard and garden area often has a fountain in the center that helps keep the riad cool in the summer as the breeze blows over the water. Many riads will also have flowers and citrus trees providing shade and fresh fruit within the central courtyard area. 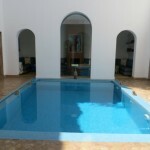 And sometimes depending on the size of the riad even a small swimming or plunge pool. Riads are often architectural masterpieces with much care being taken into the tile work on the floors and pillars and intricate moldings along the ceilings. Sometimes the ceilings are made with wood and painted with little flowering designs. In the past most riads were private homes enjoyed exclusively by individual families. Now however because of the cost and upkeep of a riad many have been transformed into unique bed and breakfast style hotels often keeping to the traditional Moroccan décor, but adding in modern amenities found in most 4 and 5 star hotels. >Because riads were often at one time old homes each room tends to be laid out differently, but each with its own in suite bathroom. Moroccan riads are also famous for their narrow and winding staircases which lead to upper rooms and roof top terraces. As riads are smaller establishments than hotels, usually 6 to 8 rooms total, you often receive more personalized attention by the owner and/or staff at the guest house. 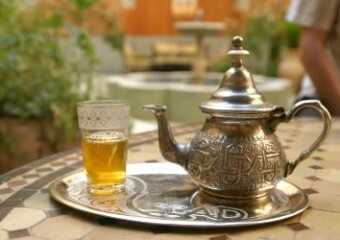 Many will welcome you into the riad with a glass of mint tea and occasionally traditional cookies. 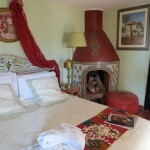 It is also not unusual to be welcomed by the owner or manager of the riad upon your arrival. All of this makes for a more intimate and personal experience that many travelers have loved over the traditional hotel experience. 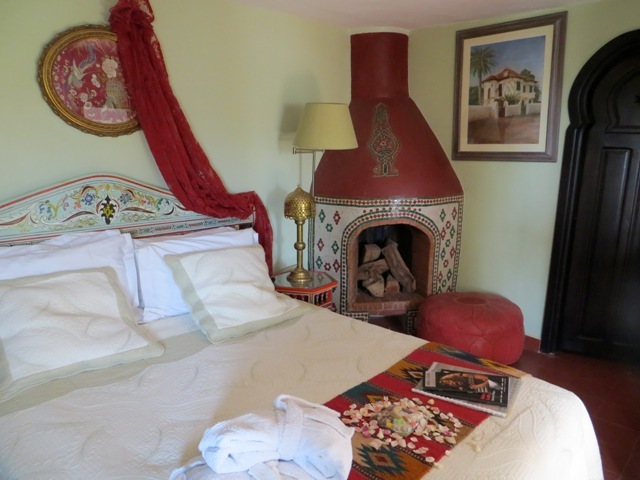 Another example of a riad room. So, if you are looking for a new experience and warm and welcoming staff we would propose you try to stay at a few riads during your visit to Morocco. 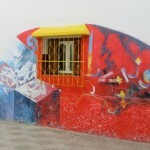 When people visit northern Morocco they often visit Tangier but skip its neighbor, the small artsy town of Asilah. Up until this year I was one of those people who skipped over Asilah, as well, passing through the train station but never stopping to get out and explore. I finally took the opportunity this April to spend a night in Asilah with a friend. We went up from Fes by train, a short 4 hour journey through scenic countryside and towns. You might even get the chance to see some camels grazing on the hills nearby. Being April, everything was quite green still. It seemed odd to see camels grazing in bright green patches of grass when my mind is use to seeing them in sand dunes, surrounded by golden colored sand. On the day we arrived, we could not have asked for a more beautiful day: the sun shining brightly, a huge clear blue sky above, and not too hot or too cold. After setting our bags down in the guest house, we headed off to find some lunch. Meals are cheap in Asilah and tasty, too. We decided since we were along the coast to have seafood. My friend ordered a fish tagine and I got sole. 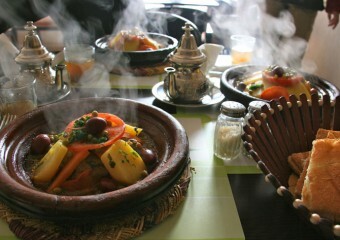 Both were cooked in a delicious blend of spices–and for around US $3 a plate who can complain? We were both surprised to find that most people wanted to speak to us in Spanish. Asilah often gets quite a few Spanish tourists who come down to enjoy the beaches and a Moroccan experience during summer holidays. Several of the old city walls are painted with large colorful murals. I heard these murals change each year as there is an annual art competition where artists paint murals on the walls. The favorite paintings get to stay up all year. If you are in the old city around sunset time, there is a great lookout point along the outer wall near an old cemetery. 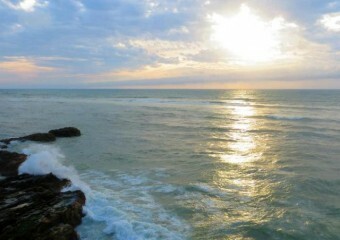 It is a popular spot for tourists and locals alike to gather and watch the sunset over the ocean with the sound of the waves crashing against the rock walls. So next time you are planning a trip to Morocco and looking towards the Atlantic/Mediterranean coast, be sure to include a stop in this quaint artsy town. 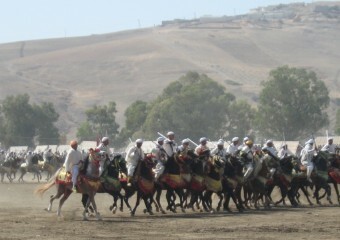 Every year, generally in the end of September/early October there is a large horse festival held for five days in the small town of Tissa, just outside of Fes. Like most festivals in Morocco it can be hard to find out about the exact dates and details before it happens. However, if you happen to be in Fes over the time of the festival it can be a great cultural experience. 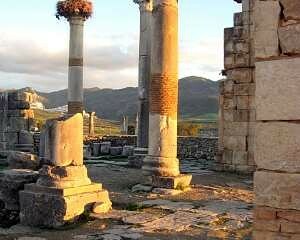 Tissa is a small town about a 40 to 50 minute drive outside of Fes. The drive from Fes to Tissa is quite pretty as you drive by fields, hills, farmland and occasionally the river. The two easiest ways to get there are probably by grand taxi or private transportation. Grand taxis are old Mercedes Benz vehicles in which they squeeze four people into the back and two people upfront plus the driver. You pay by the seat. So, if you are a person used to a bit more leg room you may pay for the two seats upfront and have more space to stretch out. Usually fairly inexpensive the grand taxis travel between cities. There are also various travel companies who if told ahead of time can help arrange private transportation and a driver to and from the festivities, including The Travel Source. Upon arrival in Tissa it is not hard to figure out where the festivities are being held. All you have to do is follow the sounds of the loud bangs. The festival is most known for its fantasia. Fantasia is the name given to a traditional equestrian performance in which groups of horse riders wearing traditional dress and carrying traditional rifles will line up in a long line and charge straight ahead trying to keep in a single formation. Upon arriving at the end of the field they will come to a sudden halt and fire their guns in the air. The group who can keep the best formation and who are able to fire their guns all at once making it sound like one loud bang instead of several small bangs are the most admired, as well as most likely to be in the run up for prize money which is given out at the end of the five day affair. The Tissa horse festival this September, 2012, was made up of young men from around 12 years of age up to men who appeared to be in their early 70’s. Fantasia is a cultural tradition that tends to be passed down from grandfather, to father, to son. It not only takes great skill and practice, but also a love between the horse and its master. It is good to note that they do not use live ammunition. If you would like to see an event like the fantasia held in Tissa, but can’t come during the dates of the festival there are a couple of restaurants, especially in the Marrakech region, who will put on a dinner and a show for their guests. The show will often include traditional music, belly dancing and fantasia. Let us know if you are interested in adding something like this into your program. 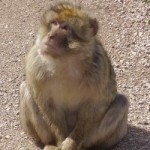 For travelers looking for an adventure off the beaten path, Laayoune makes a wonderful choice. The city is only about an hour and a half long flight from Casablanca yet has a feel all of its own. 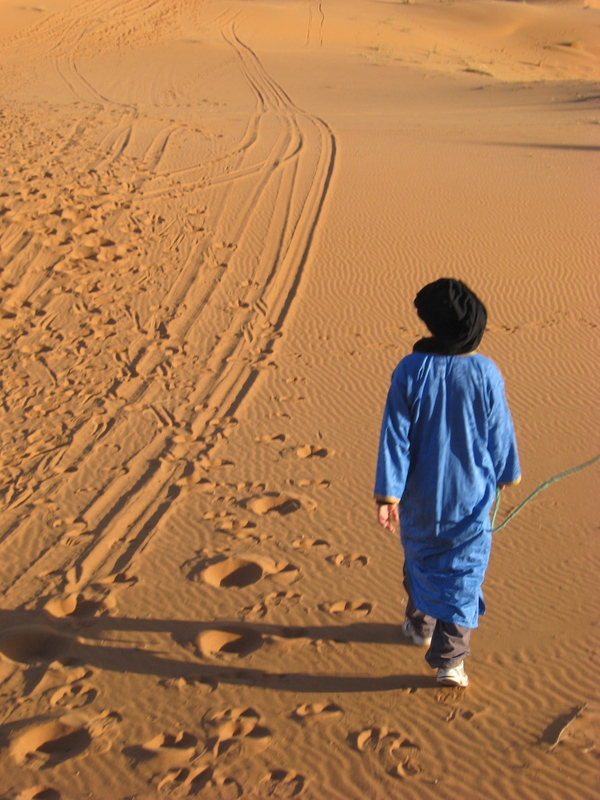 People who live in Laayoune are a mix of Moroccans and Saharawi. Women in Laayoune wear a brightly colored dress called a melafa. A melafa is most similar to an Indian sari and is often worn with a long sleeve shirt and leggings underneath. The language also changes. Like the north, Spanish is widely spoken as a second language and most people speak either Moroccan Arabic or Hassaniya (another dialect of Arabic often spoken in countries like Mauritania, Niger, Mali and parts of Morocco) as a first language. While Laayoune is not frequented by tourists, there are still some lovely sites to visit if you get the chance to travel there. 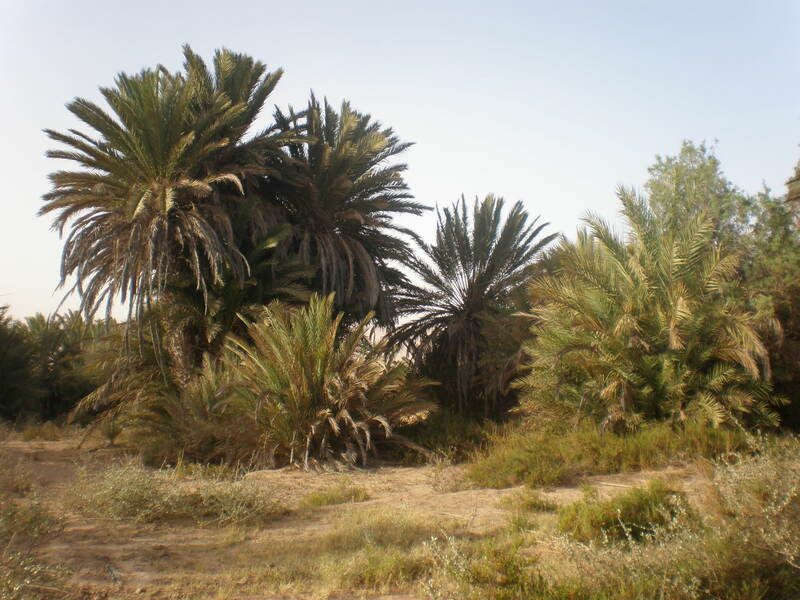 One of the things that the area is known for is its beautiful oases. 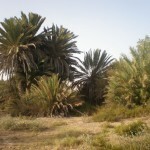 On a recent visit some of my friends and I got to visit one of the oasis’s that is especially catered towards tourists. We drove about a half hour outside the city. Everything around us was quite dry and barren, but then we came upon the Oasis situated on the side of a small hill. The Oasis was surrounded by a gate, but after knocking on the door of the owner’s house near by we were met by a friendly young man who opened the gate and allowed us inside. The grounds are quite large with a few tents available for those wishing to spend the night, several palm trees, a few hammocks and sitting areas as well as a small stream which runs into a pool in the middle of the Oasis. We chose to have tea near the pool. I believe it was the most relaxing part of the trip to sit by the pool with the only sounds around us the sounds of the wind rustling the palm trees and the occasional squawk of a bird flying by. Laayoune is also a unique city in that it has been built up in the middle of the desert right next to the sand dunes. From certain parts of the city you can see both the city and the sand dunes behind it. Being so close to the dunes provides several opportunities to take camel treks out into the dunes or even spend the night in tents under the stars. The ocean is also not far to get to. After driving outside the city for about 20 minutes you come to the ocean. The drive out to the ocean is beautiful in itself as the road to the ocean passes through the middle of the sand dunes. Bulldozers come about once a day to clear the roads from sand that drifts over it. 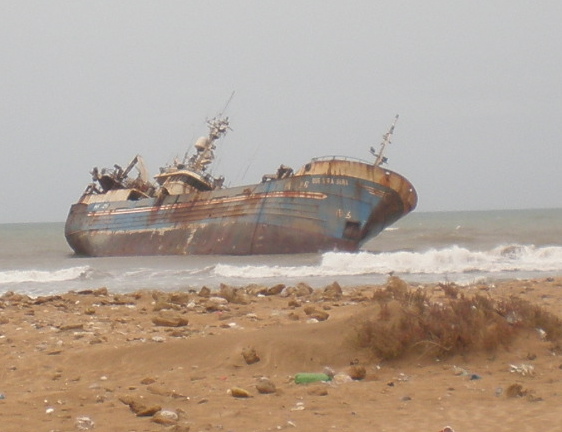 If you make it to the ocean, be sure to look for the old run aground French ship appropriately named, “Que Sera Sera”. Because the ocean is close by, fish is often eaten in restaurants and homes. One of the famous dishes they eat is fish and rice. Fish and rice consists of a large plate piled with saffron rice and then covered with chunks of fish and vegetables cooked in a flavorful sauce. While Laayoune is a relatively safe city to visit, it is good to be aware of your surroundings and be careful not to take pictures of military or police buildings–of which there are several. Also, it is wise to keep your passport with you at all times as there are several checkpoints where your passport is required. Feel free to contact us for help planning your own Laayoune adventure! 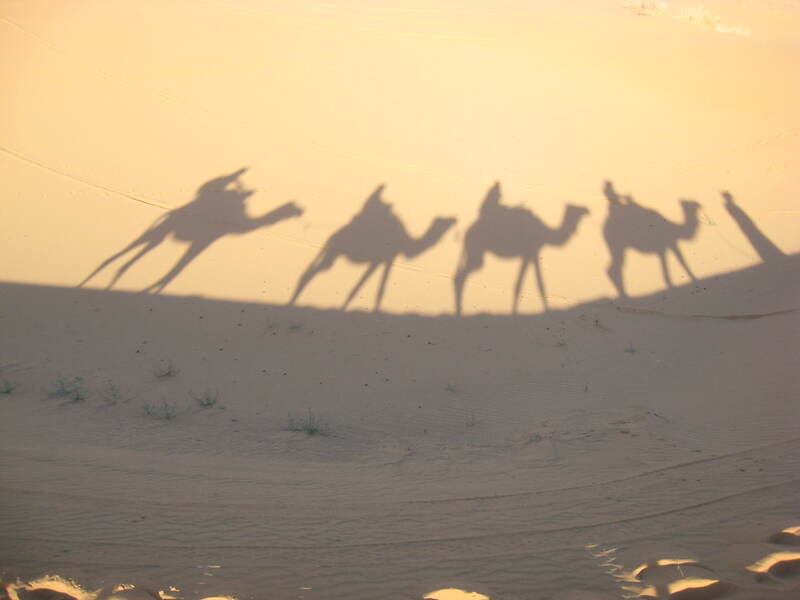 I recently had the opportunity to go to the Sahara desert with a few friends. Although I have been to the desert before, it never ceases to amaze me when I visit. This was my first time though to visit in the winter, January, and it was cold. We went by overnight bus leaving from Fes and arriving to the cold, fridged air of the desert town, Rissani, early the next morning. Upon exiting the bus we met our driver who would take us to the guest house where we could rest after our night long bus ride. We rode to the guest house in the dark. However, as soon as the sun came up, a beautiful sight awaited us as we saw the dunes at the doorstep of the guest house located in an ideal spot on the very edge of the dunes! Our day was spent reading by the poolside, napping, drinking tea and coffee, walking on the dunes, and laughing at ourselves as we each tried our hand at sand boarding, without much success. It is harder than it looks. 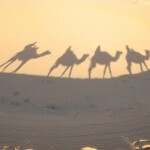 Then near sunset time we were led to the camels patiently waiting for us to begin our trek out into the dunes. Our guide, Moha, walked in front of our camels leading the way. I was amazed by his ability to walk so effortlessly in the sand as I was tired after walking on the dunes for just ten minutes. 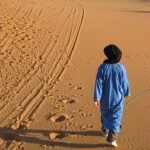 But, Moha–like all the guides at the guest house–was born and raised in the Sahara. The sand is as normal for them as the cobblestone sidewalks of the old Fes medina are to me. We arrived at our campsite at the edge of the tallest dune, Erg Chebbi, around 150 meters, just as the sun was setting and were served delicious glasses of mint tea and peanuts to snack on as we waited for dinner. Following a delicious dinner of chicken and vegetable tagine, Moha and his two friends built a campfire for us and brought out their drums. What a fun and memorable night! We listened to the men sing and play their drums while lying back on the mattress placed for us on the sand. There seemed to be millions of stars above our heads, as well. Early the following morning one of my friends and I decided to wake up early to watch the sunrise over the dunes. We climbed halfway up the tallest dune in the desert, Erg Chebbi, and sat down to watch the sun come up. It was eerily quiet and still except for the occasional crow of a rooster or snort of a camel. (One of the benefits to going to the desert in the middle of winter is that there are not many people who visit that time of year.) Following a gorgeous sunrise we went back down to the tents to be served breakfast and then it was up on the camels again for the morning trek back to the guest house. The remainder of the day was spent with more relaxing, walking on the dunes, reading books by the poolside, and talking with the staff. In the evening we were driven back to the bus station where we got on the bus once again to return to Fes. We arrived back in Fes early in the morning on the third day, exhausted, but filled with many wonderful memories that I am sure will stay with us the rest of our lives. Please feel free to contact us for information on how to have your own memorable experience of the Sahara desert, either as a part of a package tour or separate. Snow is not a word that comes to mind when people think of Morocco. More often than not, people’s first thoughts are images of sand, palm trees and camels. Living in Fes, Morocco, I have the privilege of being about one-and-a-half hours away from the mountain town of Ifrane which every year seems to get at least one good snow fall. 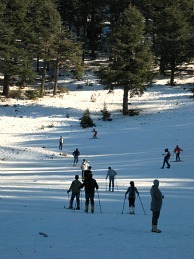 When the snows come to the mountains south of Fes, there is great commotion. It is broadcast on the local news; on the weekends the mountain roads get packed as city dwellers drive up to the mountains to go sledding, skiing, snow boarding, or just to enjoy the beauty of the snow. 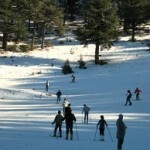 There is one particularly famous location for sledding and skiing just past Ifrane called Mischliffen. At an altitude 2100 meters (6900 feet) it tends to stay colder longer than in Ifrane, and the snow stays longer on the ground. 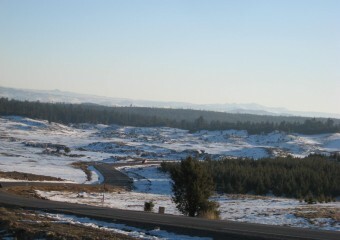 Mischliffen is said to be an old volcano crater which hosts a few small hills that are now used for sledding or skiing. There are ski lifts, but they do not always work. 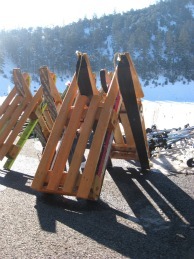 When there is snow in Mischliffen, men renting skis, sleds, snow boards, and even boots seem to appear out of nowhere. For 20 Moroccan dirhams you can rent a sled for the afternoon. 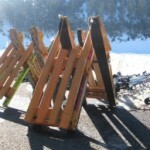 The sleds are creatively built out of wood and old skis. After an afternoon of sledding, snow boarding, or skiing you may wish to walk over to the only hotel in Mischliffen, Hotel Aglias, for a cup of hot chocolate or coffee to warm up. If you are in Fes for more than a day over the months of January and February, going to the mountains and playing in the snow can be a wonderful day trip. If you have the privilege of being able to visit Morocco you will quickly come to discover that the country is famous for one in particular drink, mint tea. Everywhere you go you will be offered traditional mint tea; whether it is upon arrival at your riad, while looking at rugs in the carpet shops, if you are invited into a local home, or after dinner, tea is everywhere. The mint tea is often served from shiny silver or gold tea pots and poured into small glass tea cups. Sometimes the tea cups are simple with just an etched leaf pattern on the sides and other times they can be fancy, made of different colored glass. Mint tea is generally made with boiled water, fresh mint tea leaves, Chinese gunpowder tea, and lots of sugar. Sometimes all the mint leaves will be thrown into the pot to cook with the tea and other times you might find a sprig of mint in your cup. In a home often the woman of the house will pour the first glass of tea into one of the tea cups. She will then pour the tea back into the tea pot. She will do this two or three times and then pour just a tiny bit of tea into a glass swirl it around and taste it to make sure it is suitable for the guests and has enough sugar. If it tastes right she will proceed to pour tea into all the glasses holding the tea pot up high to create foam as it fills the glasses (the more foam in a glass the better) and finally will pass out the glasses of tea to be enjoyed by the guests. Place 3 to 4 cups of water in a pot on the stove and bring water to a boil. Place 1 tablespoon of gunpowder tea into the bottom of a teakettle or another pan. Add a small amount of boiled water to the gunpowder and swish around. Remove water from the teakettle or pan leaving behind the gunpowder tea. Add to the gunpowder 3 tablespoons of sugar and 3-4 sprigs of mint. Cover with the remaining boiled water. Place teakettle or pan on stove and bring the tea to a boil. Once boiling remove from heat. Mix the tea by pouring first one glass of tea into a cup and returning it back to the teakettle and then repeating this step 2 or 3 times until mixed. 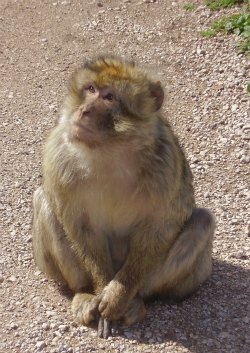 “The friendliest of people” are often the words people use to describe the south of Morocco and especially the area around the Todra and Dades Gorges. The most famous spot for tourists is the towering Todra Gorge in Tinerhir with its 600 foot towering walls between a narrow canyon. However, the less visited Dades Gorges in Boumalne du-Dades, often called the grand canyon of Morocco, are equally as magnificent with the natural beauty of the rocky mountains towering around a lush valley below.